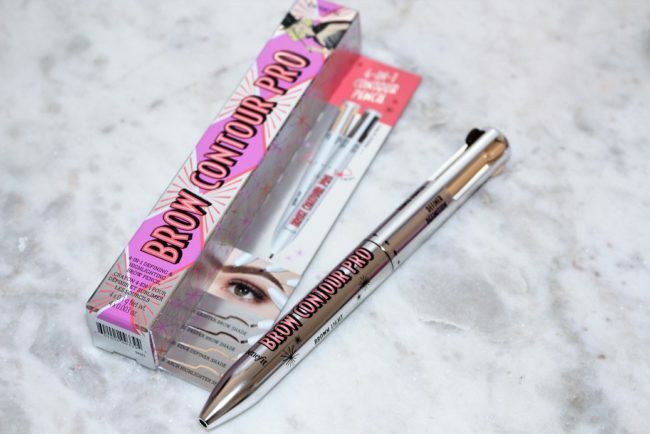 Testing Benefit New Arrival – Brow Contour Pro Pencil – Up to Become a Hit? Hey, girls! I’m sure that regular guests on my blog know I have a soft spot for novelties and new cosmetic arrivals. Benefit belongs to my favourites and nearly every product they launch turns out to be a hit. It is though-out, innovative, finest-quality, original. Brow Contour Pro has been launched recently. Of course it’s already causing a stir on the Internet because it’s untypical and… you simply have never dealt with this kind of a product. What it looks like, what’s so unusual about it? What’s the effect and is it worth having in a beauty bag? Enjoy the Benefit Brow Contour Pro review. What is Benefit Brow Contour Pro & what it looks like? Generally speaking, it is an eyebrow make-up product. Going into details – it is a revolutionary eyebrow pencil which contains four matching colours so that you can magic perfect brows up. All four tabs are hidden in one pencil. It looks exactly like a four-colour pen you used at school. Each tab has a separate zip at the end of the pencil. Simple, practical, thought-out. Obviously, because this innovative eyebrow pencil conceals 4 tabs – the pencil is quite thick but it is not really handy. It’s cool that the pencil is available in 5 shades so each of you is going to find the right colour. Press down the light brown tab and twist until you see the product, then, gently outline the edges of the brows in the inner, thicker part (above the inner eye corner); fill them in with the colour. Time for the external part of brows – from the arch to the tail, or above the outer eye corner – fill them in using a darker shade. Now, reach for a light matte definer – use it for outlining the entire brow line gently. This greyish shade is going to gently lighten the brows, remove the unwanted lines that you may draw during make-up, it gives the brow arch a perfect shade whereas the contour won’t look unnatural or overdone. Time for the highlighter – the tab delivering a light pearl finish. Apply it right below the brow arch – the highest point. In this way, eyebrows look lifted, you look radiant whereas your eyes look rested. Gently rub the highlighter using your finger or a tiny sponge e.g. a traditional eyeshadow applicator or a brush for blending. To me, Benefit Brow Contour Pro is… flawless. I don’t have any objections, maybe except the capacity which is small and I’m afraid it’s going to finish quickly when used for daily make-up. Considering it’s a 4 in 1 product – the price isn’t that scary. The product is highly pigmented and waterproof. The tabs in Brow Contour Pro are very soft – make sure you don’t press the pencil too harshly because you might break the lead or overdo your make-up. The product glides smoothly on skin and excellently fills the brows in – no clumps or clots, contrary to most brow products. Because it’s soft, Brow Contour Pro lasts quite long. No wonder it gets great reviews from bloggers and vloggers. The shades are nice and very natural-looking whereas the highlighter is soft and extremely easily spreads below the brows. I also use it for enhancing the inner eye corner and nose bridge. I recommend Brow Contour Pro: to me it’s one of the finest eyebrow make-up products.